Contingency Plan: Plum & Walnut Jam – Eat Me. Drink Me. The world doesn’t always revolve the way you want it to. Take today, for instance. I woke up feeling disgruntled: My alarm wasn’t set to ring for another 45 minutes, but the pillow felt lumpy beneath my neck, the temperature was too hot under the covers and too cold on top of them, and the first rumbles of construction work were already drifting through the open window. So I got up and shuffled to the bathroom to get the whole waking up thing over with. Breakfast was uneventful. I didn’t throw oats across the kitchen floor or slip on a puddle of milk, and so I hoped that maybe it was a foolish premonition, that the day would be fine, that I’d pep up. But one by one, little things kept going wrong. The sun came out just as I was taking advantage of the overcast sky to start a photo shoot, I discovered SAND was dangerously behind schedule for its upcoming issue, plans I’d made had to be rearranged and then arranged back. And to top it all off, I was tired. Just glumly, eye-rubbingly tired. I have a plan in place for grumbly days. It’s: take a nap and start again. It’s like getting all your lives back after the Game Over screen has finished flashing. Like waking up with a new face after plastic surgery. Except without all the messy bandages and bruising. It also involves a cup of coffee after the nap. Clearly. Last night after work, my boss and I biked to his city garden plot and picked plums from his tree. The branches were weeping with fruit, and when he shook them, it rained pretty purple plums. They nestled in the grass like Easter Eggs the bunny hadn’t bothered to hide. We left the garden with two hulking garbage bags of plums each, and I spent the evening watching all three endings to the 1985 classic Clue and cleaning plums. Then I watched another movie and kept cleaning plums. Then I gave up and went to bed. On my redo of the day, I gave up trying to work, and got to work on the pile of plums instead. I made jam for the first time ever a few weeks ago, when I was in Burladingen visiting my family. We were sitting around the dining room table, lazing after a long dinner, when we noticed my grandfather had gotten up and left without saying a word. “I’ll go see what he’s up to,” I said, and got up from the table. I found him in the basement, rattling a bag of glass jars. “Here, take this to the kitchen,” he said, and thrust the bag into my hands. I walked upstairs and placed the glasses on the counter, and turned around to see my grandfather had followed me up. 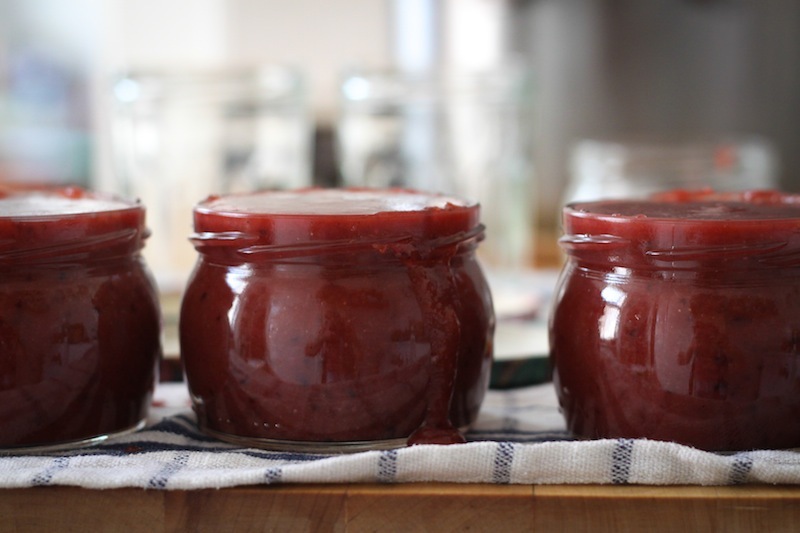 “If they don’t need you in there anymore, I thought we could make jam,” he said, and without waiting for a reply, handed me a bag of frozen plums and a bag of rhubarb harvested from the garden the year before. 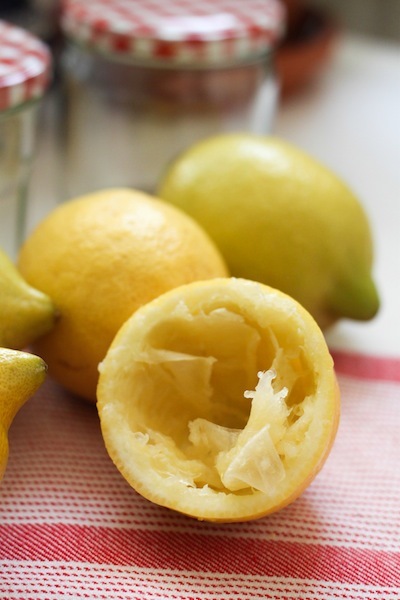 Suddenly, I found myself measuring fruit and sugar, squeezing lemons. When my grandfather went back down to the basement to grab more jars, I ran into the dining room, hands dripping with fruit juice. “Apparently, I’m making jam,” I said. “We figured something like that had happened to you,” my aunt replied. There isn’t much to making jam. 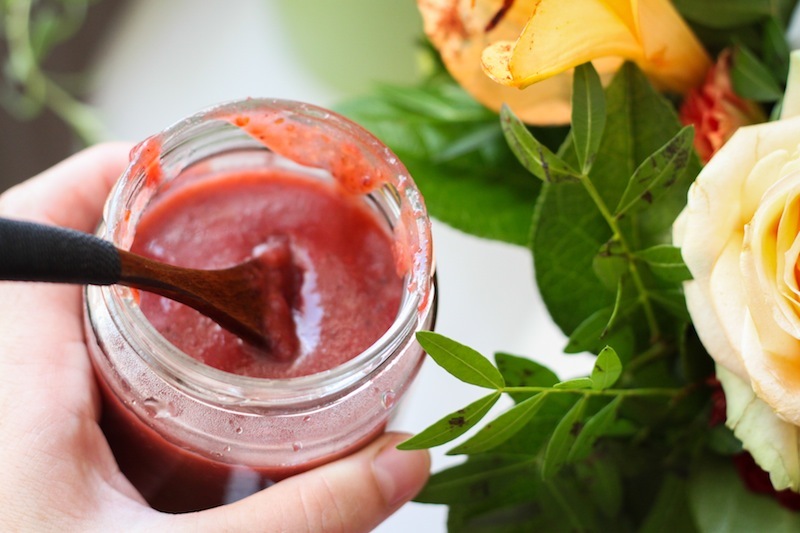 You boil pureed fruit and jam sugar with a squeeze of lemon juice, then ladle it into clean jars. That’s it. You have jam. 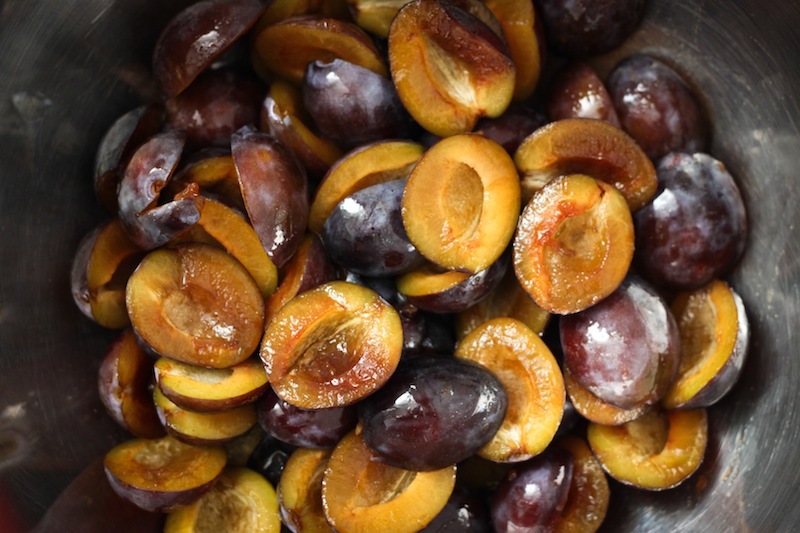 As I stood at my stove, pureeing plums with walnuts, cinnamon, and of course, a healthy dose of lemon juice, I thought about the happy turn my day was taking. 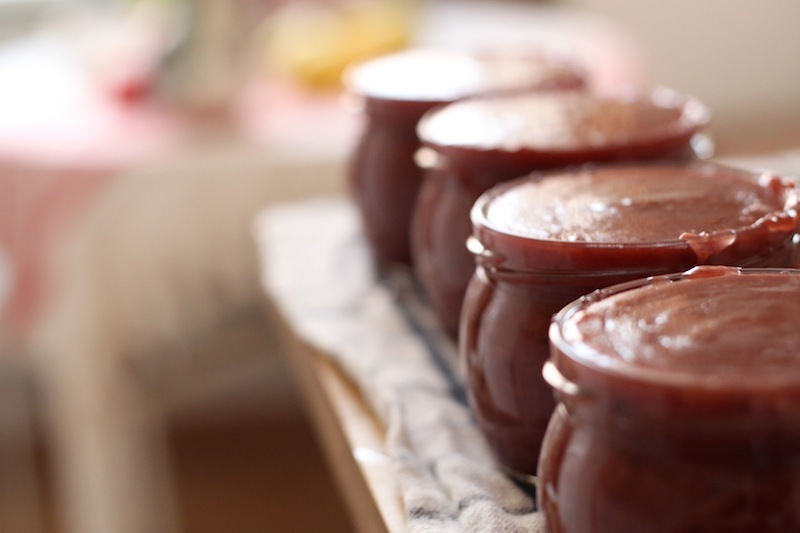 You don’t always plan to make jam, but when you find yourself making it, you might as well do it gladly. I don’t like to be a grump. Complaining and moping makes me tired and stressed; it’s a vicious cycle of negative reinforcement. And while I think the chances of being a bundle of sunshine every day for the rest of my life are slim to none, no matter how much jam I make and coffee I drink, I’d at least like to think I try to salvage every day-gone-wrong I can. There’s this fantastic thing they sell in Germany called Gelierzucker, which I’ve never actually seen sold in the States, but may hypothetically be found under the name “jam sugar” or “gelling sugar.” It’s a mixture of sugar and pectin, which helps jams to gel. I used a 2:1 ratio jam sugar, which indicates the ratio of fruit to sugar needed for the jam to set. This recipe yields around 3 1/3 cups (800 ml) jam. 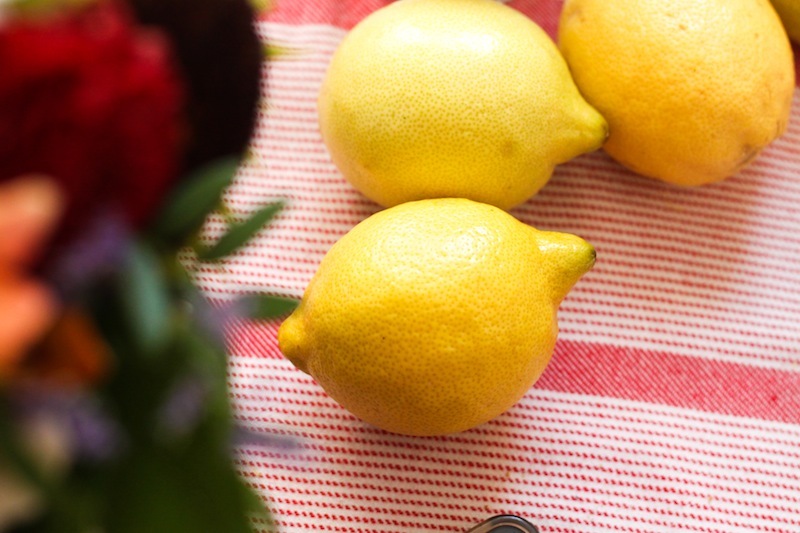 Wash jam jars and lids. I used four 260 ml jars (not quite filling the fourth jar), but other sizes work just as well. 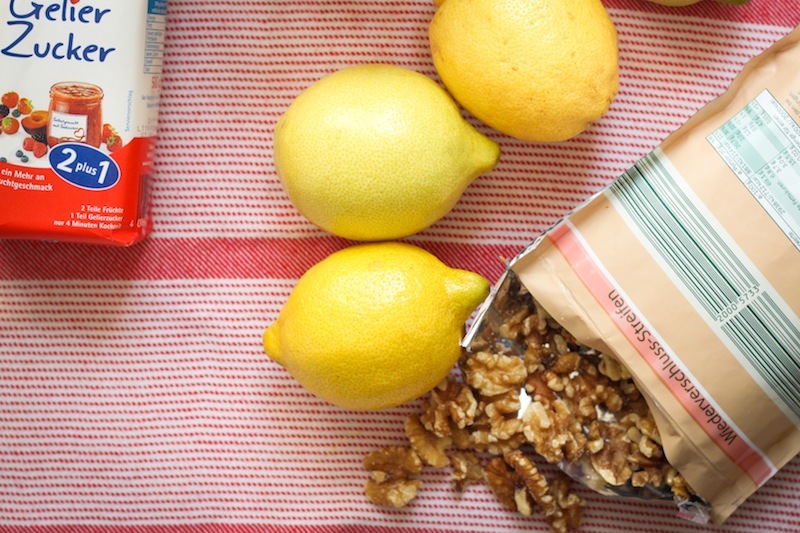 Line up the jars on a clean work surface with the lids opposite. 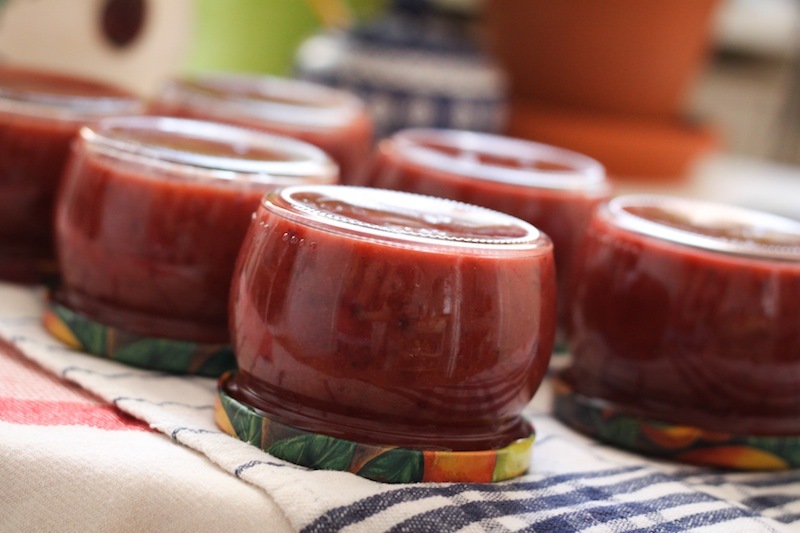 Puree plums, walnuts, lemon juice, and cinnamon in a blender or food processor until smooth. Transfer to a large pot. The mixture should only fill about half the pot (this will help to prevent splatters). Add jam sugar and stir well to combine. Turn heat to high, and bring contents to a rolling boil, stirring the contents every now and then. While the jam is coming to a boil, pour a bit of hot water into the bottom of the jar (about 1 inch is fine). Once the jam is boiling, stir the mixture constantly for exactly 4 minutes. Remove the pot from heat and place it next to the jam jars. Discard water in jam jars. Ladle jam from the pot into the jars in increments (i.e. pour 1 inch of jam into the first jar, 1 inch of jam into the second jar, etc., until all the jars are full). 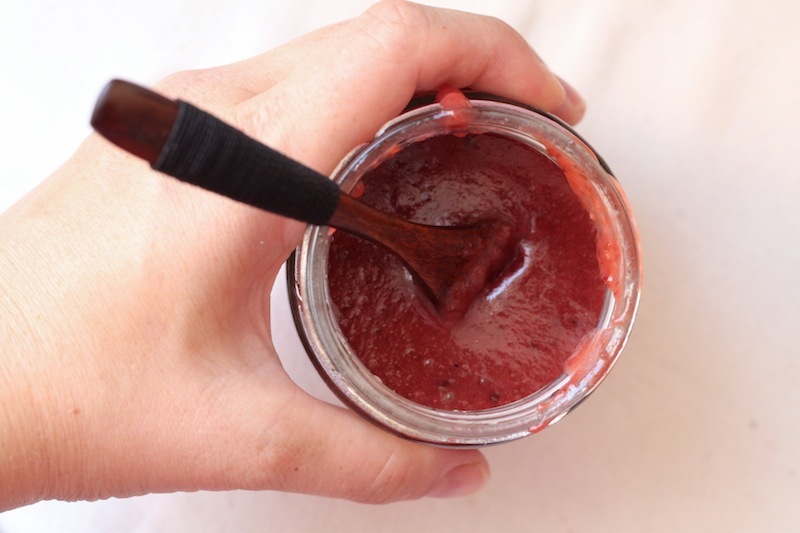 Ladle jam all the way up to the lip of the jar and make sure the threads of the jar are clear of jam. Screw the lid on tightly and flip the jar upside down. There may be one glass left over that isn’t filled all the way to the top. You’ll have to use this one immediately, since there isn’t enough jam to create a seal. The other jars should keep in the pantry. 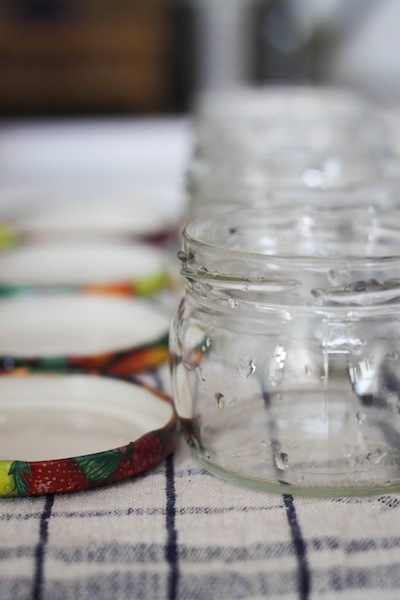 Allow jars to cool completely before moving. Helfried’s mother once made a green gage plum with anise jam that has never stopped inspiring me. Ask him about it. That sounds amazing! Maybe I’ll roll up my sleeves and make another batch of jam after all. Sounds truly delicious. 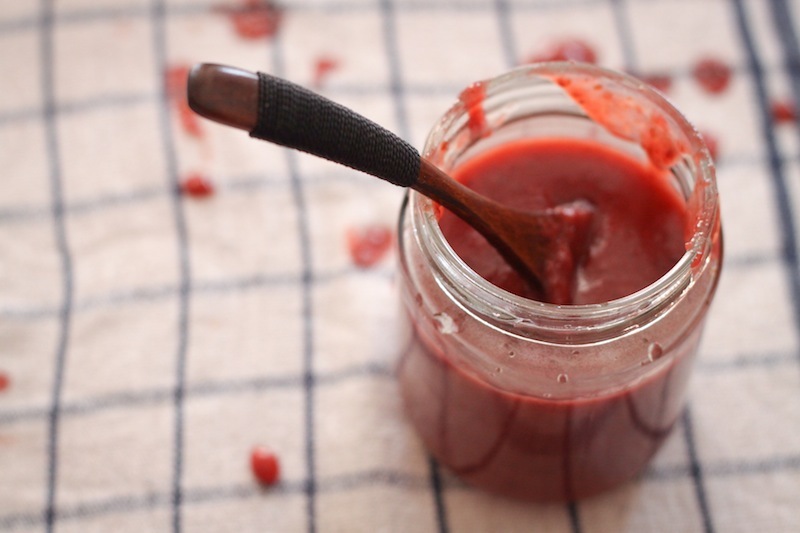 A friend just posted about making this type of jam – I had to Google it to try.